In the August Pension Digest we discussed the IRS’ new alternative procedure for waiver of the 60 day rollover rule. The IRS stated that it would be modifying the Form 5498 so that an IRA custodian which accepts a rollover contribution because the individual has furnished a self-certification rollover form will complete this individual’s Form 5498 to report that the rollover contribution was accepted/ made after the 60 day deadline. From these 5498’s the IRS will be able to develop a list of all those individuals who made their rollover contribution after the 60 day limit and the IRS can then decide to audit some or all of these taxpayers. The 2017 form 5498 is set forth below. Note, the IRS did not change the title/caption of any box to mention late rollover contributions. reporting late rollovers will be done by completing certain Postponed contribution boxes. Boxes 13a and 13c will need to be completed. Taxpayers will find this confusing. The IRS is relying that the IRA issuers and the IRA accountholders will read (and understand) the IRS instructions. For any IRS reporting from the IRS has instructions for the Issuer of the form (the IRA custodian or trustee) and also has instructions for the individual. Hopefully, the IRS will improve the procedures for reporting late rollover contributions for 2018. The IRS instructions for boxes 13a, 13b and 13c are set forth below. These are the instructions for the IRA custodian. Report the amount of any postponed contribution made in 2017 for a prior year. If contributions were made for more than 1 prior year, each prior year’s postponed contribution must be reported on a separate form. Report the amount of a late rollover contribution made during 2017 and certified by the participant. See Rev. Proc. 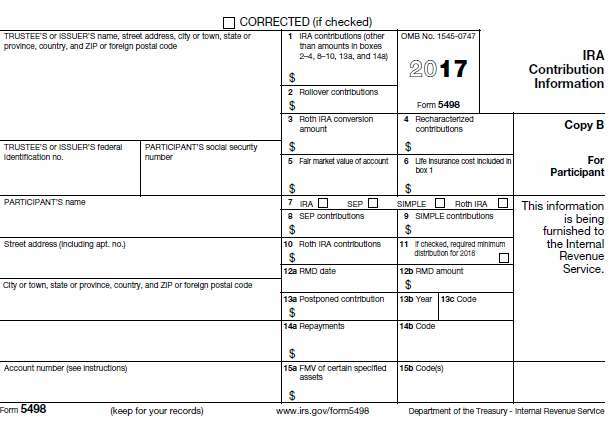 2016-47 is available at www.irs.gov/irb/2016-37_IRB/ar09.html. If the participant also has a postponed contribution, use a separate Form 5498 to report a late rollover. CWF Discussion. Report the amount of a late 2017 rollover contribution if the individual furnished the IRA custodian with his/her self-certification. A separate Form 5498 with box 13a is to be completed if their person also made a postponed contribution. The instructions do not discuss the possibility of two late rollovers. We believe the IRS instructions do discuss that two separate 5498 forms should be filed. The IRS instructions do discuss that there must be separate 5498 forms filed if there were postponed contributions for more than one prior year. Enter the year for which the postponed contribution in box 13a was made. Leave this box blank for late rollover contributions. CWF Discussion. This box is left blank if the contribution being reported in Box 13a is a late rollover contribution. Enter the reason the participant made the postponed contribution. For participants’ service in a combat zone, hazardous duty area, or direct support area, enter the appropriate executive order or public law as defined under Special reporting for U.S. Armed Forces in designated combat zones, earlier. For participants who are “affected taxpayers,” as described in an IRS News Release relating to a federally designated disaster area, enter FD. For participants who have certified that the rollover contribution is late because of an error on the part of a financial institution, death, disability, hospitalization, incarceration, restrictions imposed by a foreign country, postal error, or other circumstance listed in Section 3.02(2) of Rev. Proc. 2016-47 or other event beyond the reasonable control of the participant, enter C.
CWF Discussion. A “C” is to be inserted in this box if the individual has self-certified that his or her rollover was rolled over after the 60 day limit for one of the events set forth in Revenue Procedure 2016-47. The IRS also furnishes “instructions” to the individual on the reverse side of Copy A of Form 5498. Set forth below are the instructions for boxes 13a, 13b and 13c. Shows the amount of a late rollover contribution made in 2017 and certified by the participant, or a postponed contribution made in 2017 for a prior year. Shows the year to which the postponed contribution in box 13a was credited. If a late rollover contribution is shown in box 13a, this box will be blank. For participants who made a postponed contribution due to an extension of the of the contribution due date because of a federally designated disaster, shows the code FD. For participants who serviced in designated combat zones, qualified hazardous duty areas, or in direct support areas, shows the appropriate code. The codes are: EO13239 for Afghanistan and associated direct support areas, EO12744 for the Arabian Peninsula areas, and EO13119 (or PL106-21) for the Yugoslavia operations areas. For additional information, including a list of locations within the designated combat zones, qualified hazardous duty areas, or direct support areas, see Pub. 3. For updates to the list of locations, go to www.irs.gov/form 5498. For a participant who has used the self-certification procedure for a late rollover contribution, shows the code SC. CWF Discussion: These instructions inform the indvidual that he or she made his or her rollover after the 60 day deadline, but the IRA custodian accepted the rollover contribution because he or she self-certified that one of the exceptions as listed Revenue-Procedure 2016-47 was met. The individual will want to consider if he or she should furnish additional information at the time the return is filed explaining why equity and fairnesss means he or she qualified for a new rollover period or if he or she should wait for the IRS to contact him/her and furnish additional information at that point in time. The instructions for lines 15a and 15b should be reviewed for additional IRS guidance on the proper reporting of a rollover contribution. Admittedly the IRS’ announcement in August of its new self-certification rollover procedure left the IRS little time to create a procedure for an IRA custodian to report that an IRA account holder who had self-certified his or her 2017 rollover because he or she missed the 60 day deadline for one of the reasons set forth in Revenue Procedure 2016-47. Note that this special procedure only applies with respect to missed rollovers into an IRA on account of missing the 60 day limit. It does not apply to missed rollovers on account of the 60 day limit. It does not apply to missed rollovers on account of the 60 day rule into a qualified plan. Also note, there is no discussion of how an IRA custodian and/or the IRA account holder is to report a late 2016 IRA rollover which the individual self-certified. CWF’s recommendation is that the tax payer should attach a copy of his/her self-certification as furnished to the IRA custodian with a note of explanation.